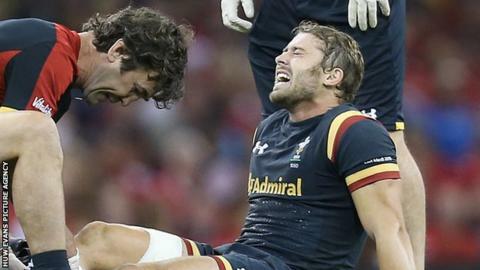 Full-back Leigh Halfpenny has been spending time with the Wales squad as he recovers from a serious knee injury. Halfpenny, 27, has not played since injuring an anterior cruciate ligament in his right knee in a World Cup warm-up match for Wales in September. The Toulon man is expected to miss the Six Nations, but Wales forwards coach Robin McBryde values his insight with France in Cardiff on 26 February. "He's good to have in the environment. He's very honest and very humble." "Someone had to point him out the other day because they didn't realise he was here! "It's good to have Leigh back, he's a quality player. The knowledge he can share amongst the squad with regards to the French mindset - that's invaluable as well, with regards to how they perceive us and some of the challenges they think we possess. "In fairness to Leigh, he's with us sharing that knowledge. It's great to see Leigh taking great strides in his rehab." Halfpenny joined European champions Toulon from Cardiff Blues in 2014 and looks likely to trigger a clause in his contract which will keep him in France for another season. The Blues had said they wanted him back, while Scarlets and Wasps both expressed their interest in the British and Irish Lions Test player.